oooh, I adore this garden. Yes! You must have a fairy sized spinning wheel. I bought a metal pencil sharpener shaped as a traditional wheel. The size might be right but...I think your fairies need a wooden wheel. Welcome back! It's so good to see you posting again! I'm happy that you took the time you needed to 'refresh', and happier, still, that you're back here with us. I missed you!! Oh wow, I actually made a little squeaky noise when I saw that. SO COOL! Is it weird that I'm kind of dying to walk up the path and plop down with the sheep? No? Good. Oh my that is adorable. I love that tiny rose!! Hee hee... this is so cool. 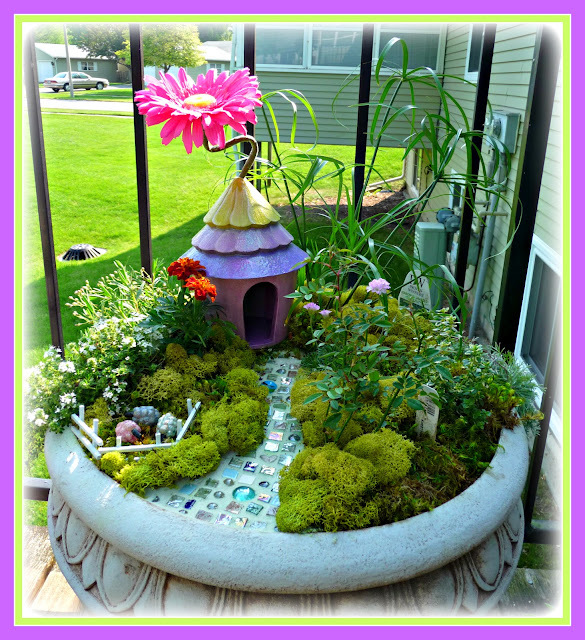 I've had a faerie garden on my list for quite a bit now too... the boys will surely love to help. Although we'll probably end up with monster truck and lego loving faeries. This is beyond adorable!! A tiny wheel would be perfect! This garden is so whimsical! I love the idea of the sheep and the spinning wheel! Welcome back! This is so adorable, and yes, a wooden spinning wheel will be perfect there. You didn't mention the base of the garden, is it a bird bath? I saw those wee sheep; a spinning wheel is definitely in order. Thanks for all the great comments, you guys are wonderful! Thanks for the nice welcome back! Very sweet....love all your attention to detail. Good to hear from you again. Oh gosh, I'm in love with that garden! It makes me wish I had a little girl to plant one with. Welcome back! Thanks Kathryn! I wish I had a little girl too, fortunately my inner child is happy to lend a helping hand!